Traditional Malay and Javanese houses were made of wood with a public area for receiving guests and then with private living quarters. For wealthy, aristocratic families, the public and private areas were separated by elaborate, costly doors such as these. 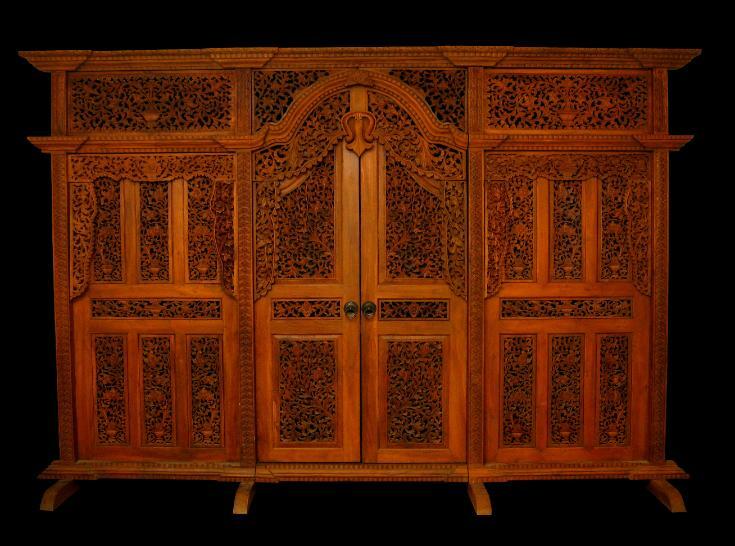 Finely carved and with much open-work to allow air-flow in the tropical climate, doors such as these were made in Jepara on Java’s north coast and then exported across the Islamic Malay world – to the Malay peninsular, to Borneo and to Sumatra. Each panel conforms to the Malay-Islamic ideal of abstract floral and foliage motifs. The set is free-standing, readily disassembled, and fits together without the aid of screws or nails.